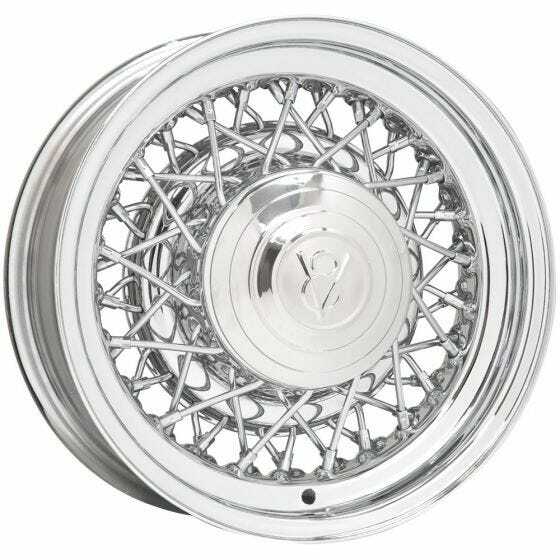 Hot Rod Chrome Wire wheels from Roadster Wire Wheel are a premium fitment for hot rods and customs. These custom wire wheels feature a strong 52 spoke design available in sizes from 14x5 - 20x4.5 inches in popular bolt patterns. 1932-35 O.E. Ford caps applicable or choose from dozens of caps to get a custom look (accessories sold separately). Also available in primer finish. Chrome Wire Wheels are warranted for a period of three (3) years from date of purchase against defects in materials and workmanship excluding the finish. Coker Tire Company warrants chrome and finish wheels and accessories to the original purchaser for a period of fifteen (15) months from the date of purchase. Oxidation or corrosion due to improper care, and/or adverse weather or chemicals is not covered by this warranty. Wheels that have been mounted, painted, or powder coated are considered used and cannot be returned. Please test fit the wheels before you mount or paint them. Please see specifications for Backspace and Bolt Pattern for each Part#. Made in USA! Caps and accessories not included, sold separately.